Today's Theme Thursday theme is lean. It just so happens I recently got lean. Get it? He he. The day after Christmas my husband and I started Ideal Protein. My husband had come home from work one day all excited about the program and wanted me to check it out with him. I'll be honest. I was pretty skeptical. My husband has been known to come up with some crazy plans. And I really didn't want to jump on some fad weight loss program that wasn't actually healthy. But I knew we needed to do something. I also knew I needed it to be something easy to follow. I basically needed someone to take me by the hand and lead me through the process. I had mixed feelings about programs that provided their own foods. The convenience factor was appealing but I was worried about proper nutrition. And, let's be honest. Those prepackaged foods are never actually good. We attended an informational meeting. It was no pressure. We got to try some of the food and I was surprised that I liked it. They also had a much larger variety of foods than I was expecting. But what impressed me most was the science behind the program. See, even though I had never actually lost weight before, I had done my research. I knew what would work. But I didn't really know how to put it into practice. Here was a program that actually addressed weight loss properly and conveniently. Exactly what I needed! Did I mention that our doctor also recommended it? What's so great about Ideal Protein? I know you are looking at the name and thinking, protein, so it's a typical low carb high protein diet. It is low carb. It's also low fat. Low sugar. The basics of the program are this. 3 Ideal Protein foods a day, one 8 oz lean protein, and 4 cups total of veggies. There is a list of acceptable veggies and acceptable proteins to choose from. The program also includes essential vitamins. It was the easiest thing I have ever done. I know everyone always says this but if I can do it anyone can. I have the biggest sweet tooth on the planet. If I could get through life eating nothing but sweets, I totally would. How was I going to entirely give up sugar?? AND CARBS?? The first three days were rough. My poor husband felt my wrath as I went through the sugar withdrawal. I cried, I yelled at him for "making" me start the diet. It wasn't pretty. Poor man didn't know what hit him. He had an easier time the first couple of days. Other than being a little tired and a little concerned that his wife had lost it, he didn't seem to have any issues. After that it was smooth sailing. I was never hungry. I was never insane from cravings. Simple. And the weight just started melting away. We learned so much about food while on this program. How to cook using seasonings rather than sauces. We really found ourselves enjoying food even more. Now that we could really taste it! Imagine, chicken not smothered in sauce or wrapped up in bread. I know, it didn't sound good to me either when we started but now I just love a perfectly seasoned baked chicken breast. The best part of the program is that it doesn't just get you to your goal and then wish you luck. Ideal Protein actually teaches you how to eat. There are 4 phases to the program. After you reach your goal there are still three more phases to help you introduce other foods back properly. That way you can actually maintain your weight loss! Alright. Ready to see how we did? 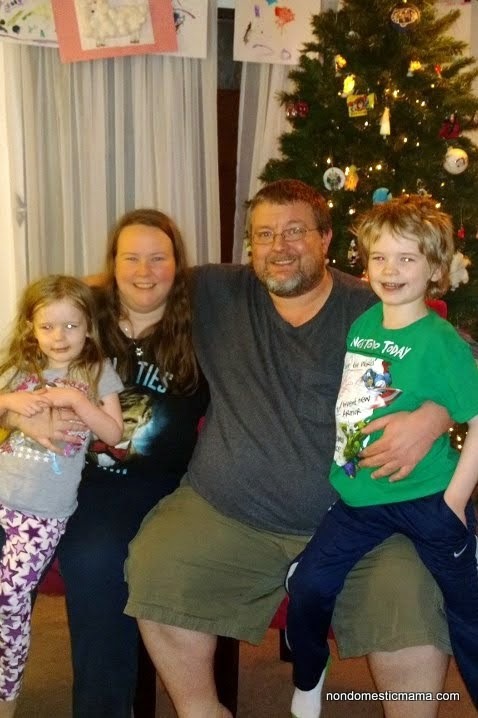 So, for some reason we don't have an actual before picture. There was only one taken of each of us but those pictures were lost. We had a plan to take weekly pictures but only managed to get one or two. We both had a bit of aversion to being in photos so I didn't have many to choose from but I did the best I could. 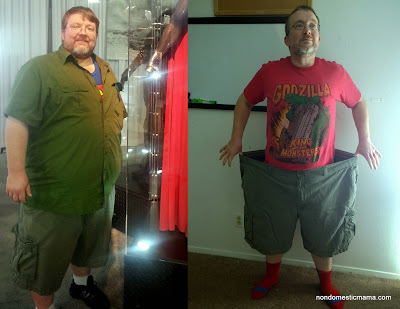 We both saved the clothes we were wearing on our very first day of the program for comparison. Since I don't have the before pictures from that first day, I found pictures of us wearing those clothes. This is the only time my hoarding tendencies actually paid off. 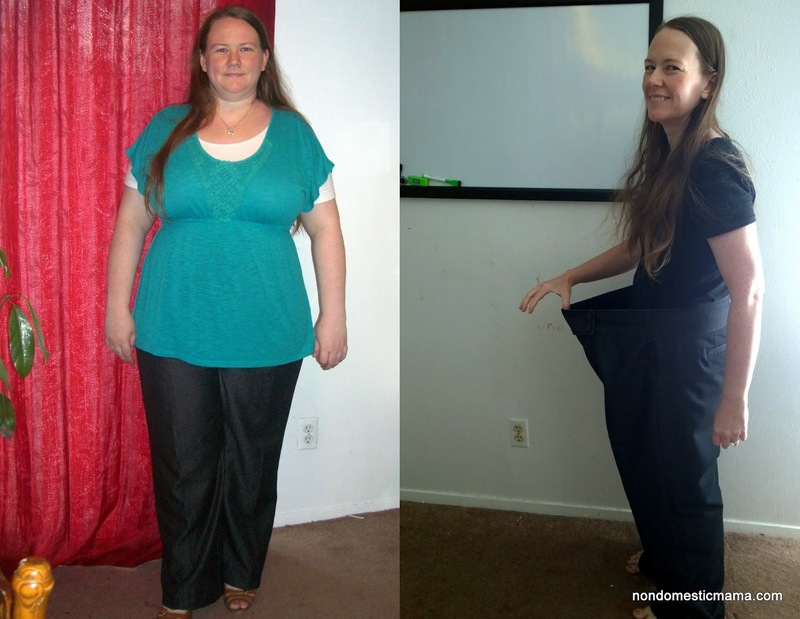 I had saved my favorite clothes from all my smaller sizes and I was able to wear them again. They didn't make up an entire wardrobe though so I don't think I could have lived without ThredUp* as I lost the weight. Because when I got about half way to my goal I could not continue to wear the same clothes any more. I didn't want to buy all new clothes since I would only be wearing them for a short time. Thankfully, I was able to send all my too big clothes to ThredUp and use the money from those to buy smaller clothes. Then I just repeated the process as I got smaller and smaller. My grand total? 100 lbs. Ok, it was actually 102 but who's counting? Oh, I am! 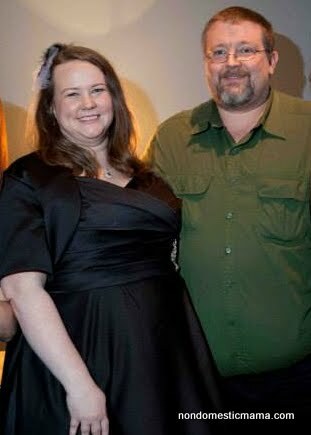 I went down from a size 20 to a size 10. I can actually fit into an 8 but it's pretty snug. 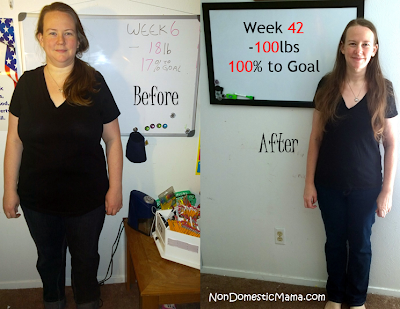 Notice, that "before" picture was taken on week 6 when I had already lost 18 lbs. Remember that dress I loved so much from eShakti? Right. It was custom fit. 100 lbs later it doesn't fit quite as perfectly. I promised myself that as a reward for reaching my goal I would get a new custom fit eShakti dress. Conveniently they are having a 40% off sale right now. AND I just got an email with a $25 off coupon to use. Winning! !